My husband Oscie and I would like to thank you for using the photo of our truck on the cover of Big Rigs magazine on August 24. This particular trip was our first Burrumbuttock Hay Run in 2016 to the race track at Illfracombe, Queensland. This trip was the biggest Burrumbuttock Hay run yet with more than 260 trucks. We were so grateful to the Apex Club in Darlington Point, New South Wales, who supplied the hay for one trailer and the second trailer was donated by Paul Moon, a farmer near Yenda in NSW. Also to my husband's employers, Commins Enterprise, who allowed us to take his truck on the run. Without them all, we would not have experienced the thrill, the emotion and the devastation of it all. My husband was even brought to tears when he went to the men's room and a man walked up to him and put his arm on his shoulder crying and said to him: "Thank you, you are all legends and give hope to us all". 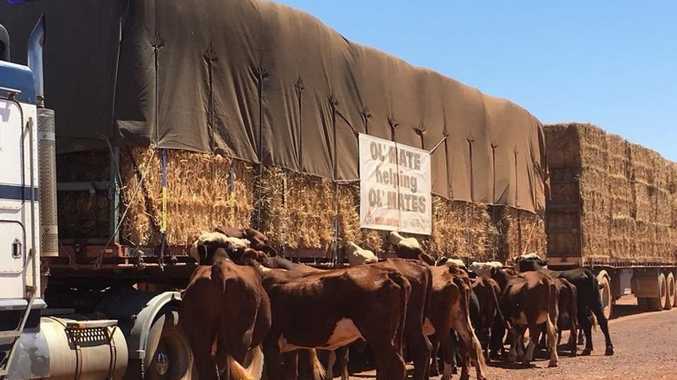 Since then we have participated in two more of the Burrumbuttock Hay Runs to Muttaburra and Cunnamulla where we actually delivered our road train of hay to the farmers on their stations. When you hear their stories of how they make ends meet for their livestock and themselves, our hearts go out to them. I have attached a photo of the cows on the station at Cunnamulla. We pulled up, with not a cow insight but before we could turn the truck off the cows had come from all directions and were eating the hay off our trailer. We are looking forward to the next hay run early next year, that is if there is some hay available. In the meantime we all pray for rain.